The Oculus Go is the next top of the line VR headse t , released by Oculus. This device packs the next level VR experience. Previously Oculus had released the Rift. the Oculus Rift has been a major success among the people who like to have an immersive experience while watching 3D movies, gaming, and 360 videos. This VR headset has new unique displays which let you fall into the world of gaming, streaming videos, watching 360-degree videos and ultimate 3D videos and movies. the Oculus offers many other features which are mind-blowing and can make anyone fall in love with them. So let’s talk about the features of the new Oculus Go. The Oculus has the inbuilt audio driver which gives you an immersive experience, it has inbuilt speakers, designed to help the games and videos more realistic, however, the Oculus also comes with a 3.5 mm audio jack, so you can plug in your favorite headphones and enjoy. The Oculus go has the all new wide angle lenses so you can have an end to end view for your eye. these lenses are designed so they can cover your field of view and provide you with an immersive experience while enjoying your games or movies. The Oculus Go VR headset used the combination of soft fabric and foam, so they can give you a comfortable viewing experience, that means that the headset can be used for a longer period of time without straining your head and areas around it, its straps are made out of non-irritating fabric and Oculus has used such materials that make it more lightweight compared to other VR headsets. Controller – the Oculus Go comes with a controller in it which features A touchpad, back button, home button and a trigger this allows you for the navigation, and the best thing about this controller is that this one’s response time is very short and give an instant feedback. 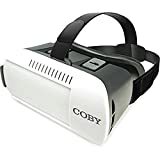 As explained above the new Oculus Go has many new features as compared its previous ancestors and many people have said that they like it better than the Samsung Gear VR, which is also hugely popular at the moment. If you are interested in checking out the Oculus Go, the best place to go is Amazon.com, where you will find the best prices, prompt delivery, and safe payment methods. 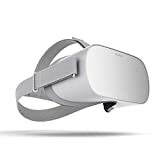 The Oculus Go is available in a 32 GB and 64GB versions from Amazon.com. Click the buttons below for latest pricing.